What sets a custom-made mouthguard apart from standard devices purchased over the counter is the fit. During a consultation, our dentists will ensure your tailor-made mouthguard fits comfortably and precisely around your teeth and gums using moulds of your upper and lower teeth. This tight fit makes it possible to speak and breathe without difficulty. It also means your mouthguard is secure and won’t fall out while you’re playing sport, unless you remove it. Contact Byways Dental Practice today to schedule an appointment and have a high quality, tailored mouthguard designed for you or a family or team member. 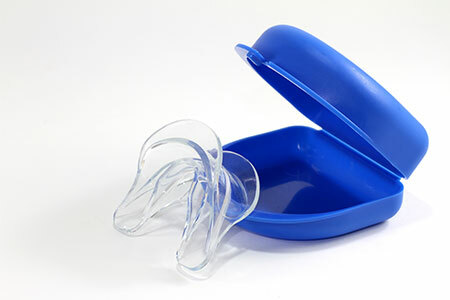 A mouthguard can either be used as a protective device to prevent dental injury during contact sports or as a dental appliance to treat bruxism (teeth clenching or grinding) or TMJ/TMD (Temporomandibular Joints/ Disorder). Whether you are an adult or child who enjoys a good sporting challenge, the mouthguard can potentially save you from unnecessary dental pain and the cost of seeing an emergency dentist for a chipped or fractured tooth. Contrary to popular notion, a mouthguard is not only suitable for team sports enthusiasts but also recommended for participants of solo sporting activities that involve contact with a fast moving object or risk of impact – examples include tennis, softball, skiing and horseback riding. Patients who suffer from TMJ disorders or bruxism can also wear a specialised mouth guard – usually custom-made by a dental technician. Bruxers are people who frequently clench or grind their teeth. Such mouthguards are worn during sleep to protect the teeth from the high stress caused by the grinding activities. By reducing the clenching, the mouthguard or splint also helps to alleviate the symptoms that TMJ sufferers experience, including jaw joint pains and headaches. A custom made guard is much more comfortable and provides much better protection than a DIY one. Quick turn around in a week. Grinding your teeth? play contact sports?